Jetty Announces Certified B Corporation Status | EasternSurf.com | All East Coast. All The Time. Jetty is proud to be a Certified B Corporation®! B Corporations are leaders of the global movement of people using business as a force for good. There are only 2,200 Certified B Corporations from more than 130 industries in 50+ countries with 1 unifying goal – to redefine success in business. Jetty is one of only four Certified B Corporations in the Surf/Outdoor retail industry alongside Patagonia, United by Blue, & Olukai. As a Certified B Corporation governed by the nonprofit B Lab, Jetty must meet rigorous standards of social and environmental performance, accountability, and transparency on an annual basis. B Corps are important because they inspire all businesses to compete not only to be the best in the world, but to be the best for the world. Jetty has consistently shown a dedication to its community and environment since its inception in 2003. It formed the Jetty Rock Foundation, an approved 501(C)3 charitable organization, which has become the nonprofit arm of the brand and a vehicle for giving back. Jetty and its Jetty Rock Foundation have donated in excess of $750,000 over the past 15 years, a staunch figure considering the company’s size, self-funding, and organic approach to growth. Jetty’s Certified B Corporation Status is like Fair Trade certification but for the whole business. Other examples of the certification might include USDA Organic certification (but not just for the carton of milk) and LEED certification (but not just for one building). Jetty co-founders Cory Higgins and Jeremy DeFilippis with the Unite/Rebuild shirts they printed in the aftermath of Hurricane Sandy, which raised hundreds of thousands of dollars for relief efforts. Performance standards of B Corps measure a company’s impact on all its stakeholders (e.g. staff, suppliers, community, customers, and the environment). Unlike traditional corporations, Certified B Corporations are legally required to consider the impact of their decisions not only on their shareholders, but also on their stakeholders. Jetty will continue its dedication to philanthropy, regional vendors, and the environment in order to meet these standards. Putting on a Jetty garment, printing with Jetty Ink, and contributing to the Jetty Rock Foundation are all ways that you can help Jetty be the best for the world! Jetty is an East Coast based lifestyle apparel company committed to the enrichment of our board-riding community. As a grassroots movement, Jetty prints and designs unique products inspired by the nautical culture at the heart of our South Jersey roots. We believe doing good is good business. Thank you for taking part in our positive movement. The Jetty brand currently sells in 100+ retailers in North America and Canada. The Jetty Flagship Store, Jetty Ink printing division, and Jetty Rock Foundation are all headquartered at 509 N. Main St., Unit #3, Manahawkin, NJ 08050. Please feel free to contact Jetty for further information regarding the company. 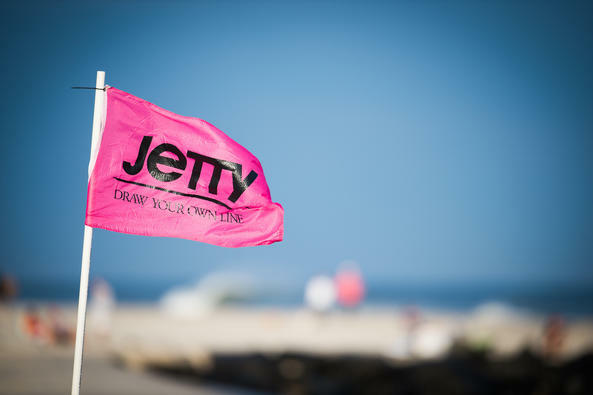 Phone: 800.900.6435 – Fax: 928.438.6825 – Email: info@jettylife.com. Draw Your Own Line! The Jetty Rock Foundation is an approved 501(C)3 Charitable Organization and the nonprofit arm of the Jetty brand. It was formed in 2013 in the wake of Superstorm Sandy when Jetty raised considerable funds through the Unite + Rebuild campaign. The JRF continues to raise funds through Hop Sauce Festival, other events, and private donations. The mission of the Jetty Rock Foundation is to enhance business, arts, and culture for the future leaders of our community.